This is a guide to assist you in purchasing a Buick Turbo Regal. The information presented here is based on a mostly stock car, as it would be impossible to anticipate all the modifications that could be present. We have tried to focus on topics which are of specific concern to the Turbo Regal, so don't rule out standard checks you would do with any car. Finally, the amount of tire-kicking the owner will allow may limit the usefulness of this list. Use your street sense as to whether they are being cautious, or just trying to hide something. When you first approach the car, you want it to be completely cold. Try to get to it first thing in the morning. BODY- Stock paint is a lacquer type and the '87 cars had a thin clear coat over the color which could fog using certain waxes. Any paint that looks "too good" for it's age is suspect, since these cars had characteristically poor paint jobs from the factory. There was, in fact, an unofficial recall on late 80's GM paint jobs. On 2dr coupes, look for cracks or waves by the top of the pillars which separate the front doors from the rear windows. These are caused by the body flexing from Buick torque! Rust is prevalent on the bottom of the passenger doors, in the bumpers, and under the rubber of the gas tank straps. ECM - If you have access to a scan tool such as TurboLink (tm) , check for stored error codes. EPROM changes are very common in these cars, so ask the owner if the original is available. You will check for stored error codes again after your test drive. Jumper across the diagnostic pins and the following should activate- low speed fan, SES light, IAC motor, wastegate solenoid. The ECM itself is located behind the kick panel on the passenger side foot well. Abnormal wear, fit, or missing clips in this area can reveal frequent EPROM changes. IGNITION - Examine the spark plug wires, since they tend to break down quickly from heat. Aftermarket wires aren't always better. The coil pack and ignition module are also subject to thermal decay, and most people prefer genuine AC Delco replacements for these and most electrical components. TURBO - The stock turbo is a Garrett AiResearch unit. Access the turbocharger inlet (compressor) side by removing the air intake (MAF) hose. Spin the compressor wheel shaft- it should move VERY easily. Examine it for any visible "play" and check the fins to see if they are damaged, shaved at the ends, or can touch the bell housing. Either is bad news. Remove the intercooler hose from the turbo outlet (intake tube on non-intercooled models), and check for wet or caked oil in the outlet tube area and the intercooler. Buick placed a metal tube from the passenger valve cover to the turbo inlet, however many people cap the inlet and put a breather on the valve cover. If this "bypass" modification has been done, there should be no oil in the turbo outlet tube (unless it's leaking from the turbo bearings!). If not, it is likely this area will be wet, because oil is inadvertently drawn in through the metal tube. If you can, measure the wastegate actuator rod length. You must remove the rod end from the wastegate lever by releasing the c-clip. Be careful, since the clip tends to spring off suddenly. The stock rod is fixed in length at 5 1/4". Any shorter indicates the turbo is likely set for higher boost than stock. Due to the excessive heat of the turbocharger, synthetic oil and/or frequent changes (<3000 miles) are recommended for these cars. Ask for documentation of this and all other service! INTERCOOLER - The 84/85 series TR's were _not_ factory-equipped with intercoolers, but the 86/87's were. The stock location is between the radiator and the crank pulley. The stock connecting hoses were thin black hoses with stainless bands to hold them on. Most aftermarket replacements are blue or black, much thicker, and may have a stainless weave on the retainer rings. Look for a tag on top of the intercooler marked "Garrett" with a serial number. Common aftermarket upgrades include extending the stock intercooler or replacing it with a larger unit behind the front grille. Any aftermarket or home brew intercooler should be examined for workmanship. EXHAUST - Stock design is 2 1/4" with one "crossflow" (one-piece with 2 pipes in/out) muffler and slant-cut tailpipe ends exiting the sides. The stock tailpipes never exited the back under the rear bumper. Check the driver's side header for cracks, especially between cylinders 5 and 3. TRANS - The stock transmission is the 4-speed Turbo Hydramatic 2004R. Check the TV valve adjustment at the engine throttle body- the throttle plate should be able to travel a full 90 degrees. If not, the shifts may be artificially firmed up by over tightening the TV adjustment. A healthy transmission with stock shift points allowed a firm (but not harsh) shift pattern. Any "slack" feel between shifts could indicate a problem. Remember this on your test drive. REAR END - Check the travel of rear axle by examining the pinion snubber, a short rubber stopper above the differential. The stock snubber is about 1 inch long and should show very little evidence of contact. Aftermarket snubbers, however, can be a few inches long and are expected to contact the differential housing. Since the rear end gets the brunt of the torque, check carefully for cracks and broken welds. While you're down here, also look for little rubbery fragments embedded under the bumper and wheel wells. They come from the local race track. OIL - check oil level. When you wipe the dipstick, there _shouldn't_ be a metallic tint to the oil on the rag!! Stock oil filter is the AC Delco PF-47, however the taller PF-52 is acceptable and has greater area of filtration. Any other filter may lack the anti-drain back feature of these two AC Delco models. FLUID LEAKS - Check under the car for leaks of any kind. Most TR's leak some oil from the rear main seal area, which will show up as wetness on the flywheel cover. Leaks are also common around the oil filler tube on the driver's side valve cover. This leak can run down the back of the engine and mimic a rear main leak. Note all existing leaks and dry them off well with a rag. After the test drive, you will re-examine them to get an idea of how bad they are leaking. BRAKES - the 86/87 TR's use the much-maligned Powermaster brake setup. Check for a gray switch on top of the master cylinder to make sure the brake recall was performed. The stock (and very dangerous) pressure switch was all black. The large round ball on the system is the accumulator. If there is a yellow warning tag on it, it was likely replaced at some time- this is common. See the technical article at for more information on Powermaster testing. TIRES - Stock size for the Turbo Regal's are 215/65/15 on 15 X 7 rims. Larger or smaller may affect gearing, rub on turns etc... Remember this on your drive test. In ignition, but not started, check all the idiot lights. The brake light should go off within a few seconds. Start 'er up....should be an easy start with no throttle assistance. Some mild black smoke from the tailpipe is acceptable, as long as it clears quickly. Too much, the car is running rich. Blue smoke indicates oil burning and excessive white indicates water; either could be a head gasket problem. Listen for unusual noises- lifters, rod knock, shaft play....light injector tick is OK, see below. If you can connect a vacuum gauge, do so. This can tip you off to a leaky head gasket, bad valves, etc.. In Park, a reading between 12" to 15"Hg with an inch of "float" is normal. OIL PRESSURE- Start up pressure is generally above 60psi, idle in the high teens, and highway pressure is generally in the high 40s. Buick spec is 37psi at 2400rpm. TEMPERATURE - Stock thermostat is 190 degrees, but common replacements are 180 an 160. Once it's warmed up, take it out for a spin. With the brake firmly applied in Drive, apply the gas and see if the turbo builds a few pounds of boost. A turbo "whistle" is normal, but there shouldn't be rattling, knocking or hesitation. RPMS/GEARING - On a flat open highway, maintain a speed of 60 mph. You should be in overdrive and this should equate to about 2100 rpms. If not, you may have non-stock gearing, or TCC problems. TCC (Torque Converter Clutch) - While maintaining 60 mph, gently tap the brake pedal for a half second with your left foot while maintaining throttle with your right. The rpms should jump up as the TCC releases and then return to ~2000 as it engages again. If this test fails, it may indicate the car was driven with an unlocked TCC, which could cause very early transmission failure. A weak 2-3 shift is a common sign of wear. SHAKES, RATTLES, & ROLLS - Try a few bumpy roads at different speeds to expose noises. It's common for the windows to rattle when down, and leak when closed on the highway. T-TOPS are prone to leaking, squeaking, etc... so listen carefully for noises from them. T-tops are generally less desirable for strip cars, as they tend to decrease stability. BEFORE YOU SHUT OFF THE ENGINE, verify the function of all accessories. Put the A/C on for a few minutes. Leave the A/C on when you kill the engine, and make sure the coolant fan stays on for 7-10 seconds. This is a function of the fan delay relay. FUEL SYSTEM - Stock fuel injectors are solid black. It is normal for them to make a slight ticking noise. Do not confuse this with noisy lifters or valves. If possible, put a fuel pressure gauge on the car and turn the engine on. The stock fuel regulator is the Bosch 280-160-233, which has no adjustment. Fuel pressure in the mid to high 30's is normal for idle. Turn off the engine and make sure the line holds pressure for at least several minutes. Fast loss of pressure could indicate any number of faulty fuel system parts. ECM - Follow up on the ECM again for trouble codes. COMPRESSION - If you can do a compression test, look for around 150psi per cylinder with no more than 10% variance. VIN STAMPS - The windshield VIN should match the engine VIN, the transmission VIN, and the VIN listed on the option code sticker on the trunk lid. A Buick dealer can enter the VIN into the computer and check any warrantee/recall work. The VIN reveals some information about the car. INSTRUMENT PANEL - The digital IP was an option, but has shown to be less than popular, since it only has a 'turbo lamp'. The analog IP had a 15psi LED bar gauge. Both were limited to 85mph readout. A GNX-style dash is a popular aftermarket accessory in TR's, since it has expanded analog gauges for speed, oil, temp, fuel, and boost. INTERIOR - The standard 84-87 GN interior was black and gray. Some rare GN's received the Lear Siegler leather seats, in a light and dark brown combo. T-types could have any color interior. The door pull-straps, the plastic steering column center, and the shifter handle are known weak spots. Check the condition of the pedals, carpets, and other controls to confirm the wear supports the odometer mileage. The gear shifter plastic has a grain which often wears smooth under normal use. RPO STICKER CODES - are located on a sticker on the trunk lid. They define what options the car had from the factory. RECORDS - Some of these cars have changed hands many times. Maintenance records (or lack thereof) can show this. They are also favorites for modifications. Make sure the workmanship is to your satisfaction! AUTHENTICITY - It is common for people to clone regular Turbo Regals to resemble Grand Nationals. Mechanically, they could be purchased identical, but there were different fascia and graphics. The RPO code for the factory Grand National package is "WE2". In short, here are a few characteristics to look for on 84-87 GN's: factory GN's have unique GN emblems, 2 on the front fenders, 1 on the driver's side trunk lid, and a smaller one on the passenger dash trim plate. The 86/87 series has "intercooled" emblems under these 2 fender emblems. The word "Buick" only appears on the dash trim plate and the front grille. The GN has a unique interior design, consisting of gray on black with the red/yellow "6" emblems on the headrests. 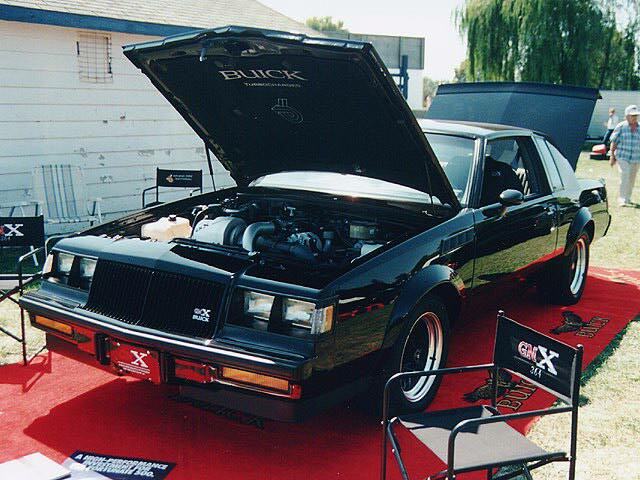 The 84-87 GN s were all black, had no hood ornament, and no exterior chrome, with the exception of the wheels and the front grille (the '87 grille was all black) The Grand Nationals also had a unique 3-piece rear spoiler. Remember, all these characteristics could be forged or transplanted. It is STRONGLY suggested that you contact an expert, such as Rob Wilson before considering a GNX purchase. The appearance of these cars is often "cloned" on regular Grand Nationals. Rob keeps a GNX registry. See the GNX Home Page for more information. "The fastest Trans Am ever made" according to the Pontiac literature describing the 25th Anniversary TA, this is yet another collector's car. It is basically a standard Pontiac Trans Am outfitted with a Buick 3.8 SFI Turbo engine, identical to the Turbo Regal engine, but with a few improvements.